athttp://www.wuvi.am or http://tunein.com/radio/VICCC365-Virgin-Islands-and-Caribbean-Culture-p562863 on Mondays and Thursdays @ 1pm Atlantic Standard Time (12noon during Daylight Savings until the Spring). For more information, complete the “Get Involved & Communicate” form on this website. Highlights are linked to historic observances for the month of July during annual observances of Virgin Islands Emancipation Month (VIEM) throughout the territory and wider Caribbean community. VICCC invites you to share your VIEM 2014 events here! July 18.2014: Nelson Mandela Day Observances. In honor of the birthday of South Africa’s 1st elected President- the Honorable Nelson “Madiba” Mandela, observances are being hosted throughout the Virgin Islands and the world. Share your commemorations and activities honoring President Mandela. Tribute on WUVI AM1090 from 1pm to 2pm on Friday, July 18.2014- www.wuvi.am. July 16.2014: Observance with National Park Service- St. Croix (NPS-STX) of Tree Removal & Planting. With environmental permissions in place and supervision of Certified Arborist and UVI Professor Michael Morgan, a St. Croix contractor commissioned by NPS-STX is scheduled to remove a 70 year old mahogany tree from the roadside of the Christiansted National Historic Park. With community engagement, the VICCC is scheduled to share a brief heritage ceremony and Indigenous libation at this site. 7:30am @ Christiansted Fort Christianvern in front of the Customs House. Call 340-773-1460 for details. July 14.2014: Tour of St. Croix Cultural Resources & Heritage Sites with Dr. Angel Smith- Professor and Director of Virgin Islands Studies Institute of H. Lavitty Stout Community College of Tortola, BVI. This inaugural tour is part of the Memorandum of Understanding (MOU) executed in May 2014 between UVI and HLSCC to strengthen collaborations and partnerships for academic research, publication and related programs for both institutions. July 5.2014: VI PanAfrican Day of the Drum (PADD) Observances- 6pm Frederiksted Waterfront. Email [email protected] for details or call 340-692-4272. July 3-4.2014: VI Emancipation & US Independence Observances (UVI Closed). St. John Carnival & Village Festivities in Cruz Bay. July 1-3.2014: Media broadcasts on WUVI and gatherings on VI Emancipation in St. Croix, St. Thomas and St. John will be featured in support of July 3rd Annual Commemorative events. Highlights are linked to historic observances for the month of June as the United States House of Representatives have designated the annual observances of Caribbean American Heritage Month throughout the nation. VICCC invites you to share your CAHM 2014 events with us ASAP! Visit http://caribbeanamericanmonth.org . June 25.2014: Roundtable for VI events in observance of Caribbean American Heritage Month (June Annually); Pre-VI Emancipation (July 3.1848); Pre-International Day for the World’s Indigenous Peoples Day (August 9th Annually) and more! June 21.2014: 9am to 10am Mixed Media broadcast on Culture in the Performing Arts. Concise discussion to encourage collaboration within the Virgin Islands amongst cultural tradition keepers and performing artists. VICCC invites you to share your vision, events and recommendations for streamlining Cultural Performing Arts in the VI! June 15.2014: 3pm to 6pm in observance of National Fathers Day festivities the VICCC hosts an annual “Cultural Roundtable with Our Fathers” gathering in the Dorsch Center’s Administrative Suites Conference Center on St. Croix. Invited contributors and fathers include: Professor Olasee Davis (UVI-CES); NswNebKaRa Herishetapaheru (NBQD/Per Ankh); Dr. Etherero Akinshegun (LSS/AHI); Dr. Carnell Troutman (FHS/MC); Willie Lewis (VIDDC/VIDOE); and Dr. Marlon Williams (WCC/SB). June 14.2014: Support for the St. Croix Community’s Observance for the Annual International Ritual of Remembrance conducted every second Saturday of June around the world. https://www.facebook.com/events/661839143884529/ A special thanks for inclusion of the VI by The Sankofa Group Project of Virginia facilitated and supported by scholars, historians and educators Mrs. Chadra Pittman-Walke, Ms. Deborah Wright and Dr. Joanne Braxton. This Remembrance Ritual is held in honor of the African Ancestors who perished during the Middle Passage/TransAtlantic Enslavement Experience. With support from Per Ankh, Inc., a UN ECOSOC Special Consultative Non-Governmental Organization (NGO) here in St. Croix, Virgin Islands, a collective of St. Croix organizations, families and individuals work cooperatively with the VICCC to provide cultural education resources for the participants and digital media documentation for this historic heritage and cultural preservation initiative. June 10-12.2014: Social Media broadcasts on Caribbean American Heritage Month 2014 Proclamation by VI Governor John P. deJongh along with other important cultural facts onwww.wuvi.am and 107.9FM DaVybe. Special coverage made available on weekly broadcasts on WUVI radian show VICaribbeanCulture Notes on Mondays and Thursdays @ 1pmEST. June 3-5.2014: Invitational workshops for VICCC interns and volunteers teaching on Caribbean American Heritage for elementary and secondary students. Supported by the National Park Service of St. Croix (NPS-STX). Highlights are linked to historic observances for the month of May as part of Virgin Islands African Heritage Week and African Liberation Day per VI Code Title 1 Chapter 11 Section 192 designating the 3rd week of May and May 25th as annual dates of observance for VIAHW and ALD respectively. May 26-30.2014: 39th Annual Conference of the Caribbean Studies Association (CSA) with the theme- Mixing without Combining? : Re/thinking Pluralist Environments in the Caribbean and the Diasporas. UVI delegates have been selected to deliver presentations inclusive of Dr. Yegin Habtes, Dr. Vincent Cooper and Dr. Chenzira Davis Kahina. Location: Fiesta Americana Hotel Conference Suites in Merida, Yucatan Mexico. www.caribbeanstudiesassociation.org. May 21.2014: 5pm to 8pm in observance of VI African Heritage Week and African Liberation Day the VICCC has organized and invites you to “Come and Be A Part of History” for a lecture and exhibition on visual arts and specs of Native American and Caribbean Ameridian Heritage by Dr. Edgar Heap of Birds of the University of Oklahoma. Special exhibition by Opi’a Taino International the Liaison of the United Confederation of Taino People. Special presentation on Native American family history by UVI Instructor Leslie Greene from the STX campus. Location: UVI St. Thomas Administration Conference Center (ACC) 142 and Videoconference to UVI AAS St. Croix EVC902 (STX Library). May 21.2014: 10am to 1pm the official African Liberation Day Ceremony is scheduled to be hosted by 30th Legislature of the Virgin Islands in the Earle B. Ottley Chambers inclusive of the raising of the African Liberation flag at the VI Capitol Building in accordance with VI Code Title 1 Chapter 11 Section 192 designating annual observances of the 3rd week of May and May 25 as Virgin Islands African Heritage Week and African Liberation Day. May 19.2014: WUVI AM1090 “The Voice of the University” broadcasts live for the first time from the UVI Albert A. Sheen Campus on St. Croix with VICCC’s weekly Monday and Thursday broadcasts of VICaribbeanCultureNotes!!! Special thanks to UVI CLASS Communications Chair Dr. Alexander Randall, V; WUVI Station Manager Mrs. April Fale-Knight; WUVI Programming Manager Ms. Dara Monifah Cooper; WUVI-STX Campus student operator Mr. Chris Sealey and EVERYONE THAT KEEPS THIS MEDIUM OF COMMUNICATION OPEN FOR UVI, the VI and our wider global community! Listen live on www.wuviam. May 17-18.2014: 50th Commencement Exercises at the University of the Virgin Islands on St. Croix and St. Thomas respectively. With support of the Office of the President, UVI Administration staff and faculty in concert with the wider St. Croix community, on Sunday, May 18.2014. SPECIAL HIGHLIGHT!!!! VICCC hosted an invitational reception and tour of our collections for UVI’s Commencement Keynote Presenter- Dr. Henry Louis Gates, Jr. Director of the African and African American Research Center and more. VICCC extends gratitude and genuine thanks for the endorsement, resource support and invitation to partner on projects soon!!! May 1.2014: Inaugural Zamani Commemoration and Opening of the Grave Yard of Time in respect and honorable tribute to the Unknown Enslaved Afrakans by the Old Pyre Mill on properties of the School of Good Shepherd Estate Williams Delight, Frederiksted, St. Croix VI @ 6pm. Special oversight honorably coordinated by Dr. George Franklin- Principal of School of the Good Shepherd and UVI Instructor. Highlights are linked to historic observances for the month of April and preparations for closure of the UVI spring semester. Final day of classes is Tuesday, April 29th and final exam study day is Wednesday, April 30th! April 28.2014: “Cultural Visions: 21st Century Issues & Solutions” a Roundtable organized by UVI Communications Students. Final presentations coordinated, facilitated, moderated and researched by students of COM120: Public Speaking. Hosted in the VICCC Conference Suite from 11am to 1pm. Space is limited so please email [email protected] or call 340-692-4283 to RSVP. April 7.2014: Annual observances and birthday celebrations for the Honorable Governor Cyril Emmanuel King born on April 7th, 1921 in St. Croix, Virgin Islands. http://www.alexanderfarrelly.com/caribbean/gov_king.asp The Office of Senator Terrence Nelson is hosting an annual ceremony and tribute to Governor King at 9am on Monday, APril 7th.2014 at the Sanctuary and King Mausoleum in Kingshill Cemetery. Call 340-712-2210 for details. April 2.2014: Workshop on Culture and Interpersonal Communications. Discussions and recommendations for strategies and research opportunities on cultural resources and communications methods linked to VI, Caribbean and global issues exchanged. Hosted in VICCC Conference Suite from 10:30am to 12:30pm. Virgin Islands History, Danish Heritage Week and International Women’s Month 2014 Observances: Share updates on your VIHM, DHW and IWM 2014 events! March 31.2014: Virgin Islands Transfer Day Student Roundtable at UVI 11-12:30pm. Discussions and speech presentations on issues surrounding the history of the purchase and transfer of the former Danish West Indies to the United States of America. References made to St. Croix Landmarks Society, Friends of Denmark and Office of the Governor of the Virgin Islands official Transfer Day event with presentation on the history of VI Transfer Day by SCLS Trustee & Chair Duane Howell hosted at the Lawaetz Museum in Estate La Grange. Additional references made to “Local Perspectives of Transfer Day” presentation hosted at the Steeple Building in Christiansted by the National Park Service of St. Croix with featured presenter Olasee Davis of UVI’s Cooperative Extension Service. For more details email [email protected] or link to All of these activities are linked to the observances and events being organized for the Centennial Transfer Day programs slated to lead up to March 31st. 2017. March 26-27.2014: The UVI Office of Student Affairs- Division of AAS Student Housing and the VICCC are co-organizing the inaugural Women…ARISE! workshops and conference. Wednesday, March 26.2014 will be the Women…ARISE! Garden Party in the Delta Jackson Dorsch Residential Complex Courtyard from 10am to 2pm. Thursday, March 27.2014 will be the Women…ARISE! “Reclaiming Your Power through Education, Entrepreneurship & Personal Development” event in the UVI AAS Great Hall starting at 7pm. Featured keynote address by internationally renowned physician Nancy Turner Banks, MBA & MD- author of AIDS, Opium, Diamonds & Empire: The Deadly Virus of International Greed. For more information on Dr. Banks research, publications and international work, visit www.nancybanksmd.com. These VI events are in alliance with the International Women’s Day 2014 theme of the United Nations’ Commission on the Status of Women of “Equality for Women is Progress for All!”. For details on UN-CSW events visit: http://www.unwomen.org/en/news/in-focus/international-womens-day. UVI, VI and wider Caribbean women and general community encouraged to attend. Please RSVP via email to [email protected] or call 340-692-4188 or 340-692-4272. March 12.2014 @ 7pm: VICCC Hosting Lecture on Dominican Republic & the Virgin Islands. In observance and in celebration of Virgin Islands History Month and International Women’s Month, the Virgin Islands & Caribbean Cultural Center (VICCC) at the University of the Virgin Islands invites the community to a lecture, digital media presentation and roundtable on Cultural Histories & Governance of the Dominican Republic and Influences in the Virgin Islands. This educational and cultural heritage program is being held on Wednesday, March 12.2014 from 7pm to 9pm at the UVI Research & Technology Park in Suite 226. Opening lecture by Patrick Cawdette- Alumnus of Harvard & Brandeis with moderator Dr. Chenzira Davis Kahina- VICCC Director. Admission free and open to the community. For more information and to RSVP, call 340-692-4272 / 340-692-4283 or email [email protected] The VICCC continues to support, nurture, respect and cultivate VI and Caribbean culture, heritage, tradition, education and more. March 9.2014 @2pm: Spend a Sunday afternoon on the UVI Albert A. Sheen Campus on St. Croix for an exclusive first-time book signing of Crucian Tales: The Trials and Tribulations of Jimbo by native-born St. Croix author and UVI alumni Wayne E. “Bully” Petersen. This book signing event features the limited special hardcover edition of Crucian Tales combined with presentations and autographed copies by the author in the Northwest Wing (by The Great Hall) on the UVI AAS Campus on St. Croix- the cultural capital of the Virgin Islands. An E-Book version is available on Amazon @ /1/post/2014/02/wayne-bully-petersen-author-of-new-book-crucian-tales-visits-viccc-jan302014.html. Special thanks to be extended for support for this Kafoonaz Arts© publication by the VI Council on the Arts, VICCC and others. Come out to support this heritage education and literary event that celebrates VI History, Culture and more! African American Caribbean/Black History Month 2014: Share updates with the VICCC of your events shared for this AAC/BHM in 2014! February 19.2014 @6pm: On the UVI Albert A. Sheen Campus on St. Croix, VICCC and the Office of Student Affairs are co-hosting the screening of the award-winning film Inward Hunger: The Story of Eric Williams. This is the first time in the Virgin Islands that a screening of this documentary film on the life and times of the first prime minister of Trinidad and Tobago is being featured. Inward Hunger was produced by Mariel Brown of SAVANT Productions. February 15.2014 to February 17.2014: St. Croix AgriFest 2014 Exhibition in the UVI-VIDA Agriculture Fairgrounds in Estate Upper Love. This year’s theme is: “Agriculture: We’ve Always Been Green” and the VICCC’s digital exhibition and artwork will share the stories of historical and contemporary cultural traditions that support agriculture that is green, sustainable and respectful of plants, minerals, animals and humans. VICCC AgriFest patrons may register for guided tours to the VICCC Exhibit on the UVI AAS campus (across the street) being offered once each day. Register at the AgriFest! February 14.2014: VICCC and CSAP (Center for Spirituality and Professionalism) Open House at UVI Administrative Suites on the Albert A. Sheen Campus from 9:30am to 3pm on Friday, February 14.2014. An official program will be held from 10am to 11:30am highlighting the unveiling of the Dr. Gene K. Emanuel and Dr. Robert V. Vaughn Collections bequeathed and donated to the VICCC. Invited guests of the Emanuel and Vaughn families will share tributes in honor of the cultural research, achievements and contributions to the VI and Caribbean of each of these scholars. Light refreshments. February 3.2014: VI & Caribbean Culture (VICC) Workshop at 2pm for visiting students of Denmark as part of the UNESCO TransAtlantic Slave Trade Danish Education Project (TST). VI & Danish Educators collaborate to provide educational legacies of the VI and Caribbean for students engaged in immersion courses of study here in the VI. January 29.2014: Roundtable on “What Is VI and Caribbean Culture to You?” and Caribbean Cultural Affairs (CCA) 2014. Overview on solutions to shift current culture from one of anger, rage and crime to one of academic excellence, integrity, compassion and safety. In the VICCC/AAS Conference Suite from 10:00am to 11:30pm on Wednesday, January 29.2014. Cultural tradition keepers welcomed to attend. January 29.2014: Presentation on “Who I Am & How We Live: Cultural & Popular Etiquette in the VI and Caribbean” in the VICCC/AAS Administrative Conference Suite from 12:00pm to 1:30pm. Light Refreshments. January 16.2014: Lecture presentation on VI and Caribbean Literary Legacy and the VICCC from 1:00pm to 2:30pm. VICCC received visiting students and educators from Denmark as they complete independent studies as part of the TransAtlantic Slave Trade Danish Education Project (TAST-DEP). January 15.2014: Lecture on St. Croix Historical Legacy and the VICCC on Dr. Martin Luther King, Jr.’s birthday (the real one) from 9:00am to 10:30am in VICCC Conference Suite. RSVP as space is limited. Visiting undergraduate students from Rutgers University (New Jersey) toured VICCC and received a concise historical lecture on St. Croix with UVI-CES Specialist Olasee Davis. VICCC Director provided an overview of current collections and comments on the life and tribulations of Dr. King, Jr.
January 8-9.2014: VICCC Cultural Bamboula and Caribbean Cultural Studies Presentations for UVI Orientation for incoming, exchange and international students during Office of Student Affairs orientation on the Albert A. Sheen Campus 12:00pm on Wednesday, January 8.2013 and 3:00pm on Thursday, January 9.2013. January 4.2014: UVI Albert A. Sheen Campus Troupe in Crucian Carnival Adult Parade on Saturday, January 4.2014. Photographs will be shared!!!! Visit: http://www.uvi.edu/announcements/articles/current/crucian-christmas-parade.aspx Contact UVI AAS Student Activities.- Successful event! December 6.2013: End of Semester Relaxation Events! 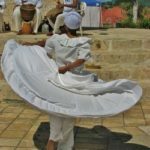 Experience Ethiopia in St. Croix. Where: VICCC Office on Albert A. Sheen campus. 2 Showings: 1pm to 2:30pm for UVI Community and 6pm to 7:30pm for UVI & General Community. Screening and Discussion of Caribbean-Ethiopian Transcultural Exhibitions, Education and New Year Festivities shared during September 2013 heritage excursion. Premiere of digital media presentation “World Cultures: Caribbean Heritage in Habesha-Ethiopia.” Informative! December 1.2013: UVI-College of Liberal Arts & Social Sciences Senior Seminar 1 Conference. Time: 9am to 4pm in UVI Albert A. Sheen EVC401 (Little Theater). Student Project themes include: Communications during Military Deployment; Skin Color and The Media; Parental Support of Sexual Education; American Media & Women’s Perception of Beauty and Being “Thin”; Impact of Ministry on Prisoners; Public Perception on Corporal Punishment; Facebook & Undergraduate school successes; Leadership Skills for Success; Postsecondary High Schools & Relationship to Salaries; Students Use of Facebook on College Campus’; Cell Phone ; Impact of President Obama’s re-election and comparative impact on Blacks in America; and others. 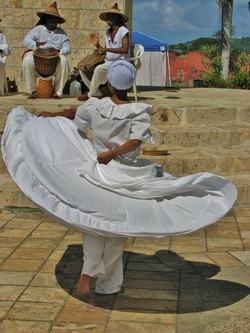 December 2013: Cultural Events for Multiple Seasonal Holidays & St. Croix Festival Season. Dates TBA. November 29.2013 @8:30am to 5pm: Fortsberg 1733 Heritage Tour in St. John in commemoration of VI Freedom Fighters Day and Historic Revolt of November 23.1733. Location: Gathering at Red Hook Ferry Port In St. Thomas for 9am ferry to Cruz Bay for opening at St. John waterfront before entering safari buses for tour of multiple plantations and Fortsberg in Coral Bay. For more information contact Dr. Gilbert Sprauve @ 340-344-3556 or Leba Ola Niyi @ 340-774-1318. November 20.2013 @ 5:30pm: The Scholarly and Creative Activities Committee of UVI’s College of Liberal Arts & Social Sciences (CLASS) invites you to their Open Door Lecture Series featuring Fulbright Scholar Dr. Min Ji. This lecture will be on Mosuo Minority Tradition: Matriarchal Culture, Folklore and Geographical Attraction. Location: UVI Albert Sheen Campus NWW103 in Dr. DiMeo’s class from 5:30pm to 7pm. Call 340-693-1260 for more information. November 19.2013 @ 3pm: Opening of “Walk In My Moccasins” Visual Cultural Education Exhibition for VICCC developed and installed by Maekiaphan Phillips, President of Opia Taino International. Visit this stunning, informative and creative exhibit housed in the VICCC that celebrates indigenous Native Ameridian culture, traditions and histories during National Native American Heritage Month 2013. See http://www.whitehouse.gov/the-press-office/2013/10/31/presidential-proclamation-national-native-american-heritage-month-2013. More details on NNAHM http://nativeamericanheritagemonth.gov. This exhibit will remain installed until January 24.2014. Call VICCC for details or to schedule a group visit! November 15.2013 @ 6pm: National Park Service of St. Croix invites you to the Grand Opening of the exhibition Imagining the Possibilities: Restoration of Salt River’s Batey developed and curated by Opal Palmer Adisa with Brian Bishop and Sara Lee Hayes. Free and open to the public from November 15.2013 to January 17.2014. Location: NPS Salt River Bay Visitors Center (Overlooking the Native Ameridian Village and Salt River Bay) from 6-9pm. Special Guest Speaker: Dr. William Keegan, University of Florida. Includes presentations by Per Ankh Drummers, United Confederation of Taino People Liaison Opia Taino International (VI) and others. For more information call 340-773-1460. 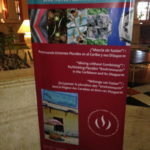 November 6-10.2013: 16th Annual Eastern Caribbean Island Cultures Conference/Islands In Between Conference hosted by Instituto Pedagogico Arubano in San Nicolas, Aruba http://www.ipa.aw. Co-Organized by University of Puerto Rico -Rio Piedras http://uprrp.edu University of the West Indies- Cave Hill, Barbados http://www.cavehill.uwi.edu University of the Virgin Islands- VI Caribbean Cultural Center www.uvi.edu and Instituto Pedagogico Arubano. 85+ Presentations by scholars of the Caribbean, Americas and globally along with the launch of the new 2013 publicationsResearching the Rhizome: Studies of Transcultural Language, Literature, Learning and Life on the ABC Islands and Beyond and Transcultural Roots Uprising: The Rhizomatic Languages, Literatures, and Cultures of the Caribbean published by Fundashon pa Planifikashon di Idioma (FPI) (Institute for Language Planning) of Curacao http://www.fpi.cw University of Curacao http://www.una.an/unasite/ and Universidad de Puerto Rico, Recinto de Rio Piedras, UPA (University of Puerto Rico at Rio Piedras) http://uprrp.edu. October 24-25.2013: VICCC collaborates with SUCCEED, Inc. http://succeedstcroix.org for VI Legislative Briefing on the cultural/environmental preservation, policy enforcement and development of the Maroon Sanctuary Park and historic lands in the northwestern region of St. Croix. October 11.2013 @ 1pm: Native American/Taino Day Observances with Educational Heritage Tour led by VICCC to the St. Croix Maroon Sanctuary Park for UVI and visiting Danish students. 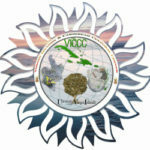 Visit these links to see photos and video from the VICCC Spring 2013 Symposia held on April 19th on St. Croix and 22nd on St. Thomas. 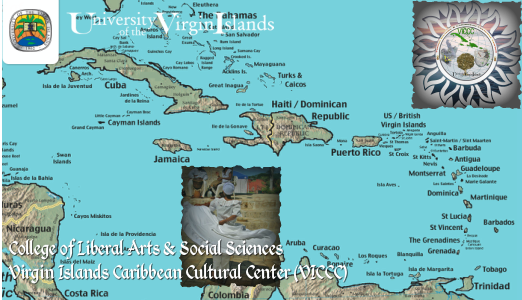 Photo and video montage of the events and programs of the Virgin Islands Caribbean Cultural Center (VICCC) that are nestled within the College of Liberal Arts and Social Sciences (CLASS) at the only Historically Black College and University (HBCU) in the Caribbean- the University of the Virgin Islands (UVI). Share your constructive comments and suggestions with the VICCC for Keeping Our VI & Caribbean Culture ALIVE!